The Seghesio Story begins in 1886 when Edoardo Seghesio departed his family’s vineyards in Piedmonte, Italy for a new life in America. Like so many immigrants, he was drawn to Northern Sonoma County and the Italian Swiss Colony, to follow his passion for winemaking. Because Zinfandel was the first vine that Edoardo planted, the Seghesios maintain their commitment to the varietal they are most known for. The Sonoma Zinfandel and the Cortina Zinfandel is full of complex, concentrated berries. 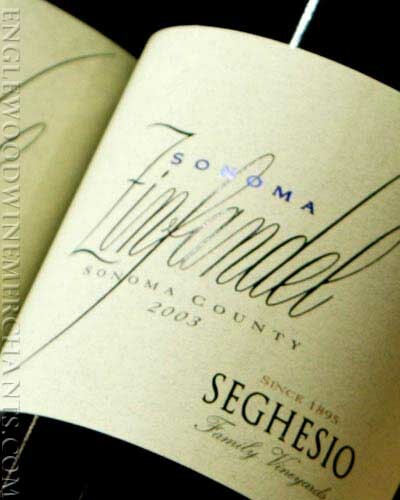 From their Home Ranch and San Lorenzo vineyards, Seghesio also produces single-vineyard zinfandels. The Old Vines Zinfandel is made from the three single vineyard sites. Seghesio also produces two Italian white varietals from their Keyhole Ranch estate in the Russian River Valley, an Arneis and a Pinot Grigio. Angela Vasconi and Edoardo were married in 1893. In 1895, they purchased a modest home in northern Alexander Valley, less for the home than the surrounding 56 acres Edoardo recognized as ideal vineyard land. They planted the “Home Ranch” that year to what has become our family’s lifeline – Zinfandel. Edoardo remained at the Colony while building his own winery in the evenings after work. Upon its completion in 1902, the young couple began Seghesio Winery while raising their five children. Seghesio produced jug wine before and after Prohibition, and produced wine for other wineries from World War II until 1983. They began producing wines under their own label, which ended up being mostly mediocre Cabernet Sauvignon and Chardonnay. Then, in the early 1990s, the IRS knocked on their door and delivered a $4 million bill for back taxes, forcing the Seghesios to make some difficult decisions. After a considerable amount of soul searching, the Seghesios realized they were building a brand that simply wasn’t sustainable. Pete Jr. reflected, “Ted and I were tired of making cheap wine. But, we had a tough time getting the older generation to believe in us. They produced jug wine their entire lives – it’s all they knew. Then one day Uncle Ed said, ‘We’re going to be the Jordan of Zinfandels,’ and I knew that he got it. By 1993, the Seghesio brand had grown to 130,000 cases of not only the family’s zinfandel and Italian varietals, but also Chardonnay, Cabernet, Sauvignon Blanc and both red and white table wine. It was in that year that control of the winery shifted to the younger generation. They turned their focus to the vineyards and eliminated all but the wines they grow reducing production to 30,000 cases. Today, they are proud to passionately produce almost exclusively estate wines, some from those same vineyards Edoardo and Angela first planted in the late 1800s.